Inspection of Puttenahalli Lake was done by Chairman of the Government Land Protection Task Force Mr V. Balasubramaniam, accompanied by Officials from the Deputy/ District Commissoner's Office and BBMP. Phase 2 of the restoration of the lake is scheduled to begin in the second week of December 2010. On 20-Nov-2010, the first step was taken in trying to clean up our immediate surroundings in whatever small way we can. There is a spot on Puttenahalli Road, in front of BM Mayflower Block entrance which has been used for dumping. Assisted by the cobbler Chakravarthy who has a shop behind the dump (and who was responsible for some of the dump in the first place) and a few others, the spot was cleaned up this morning. The rubbish was enough to fill a large sack which was willingly carried away by the garbage truck... to Anjanapura dumping ground :-(. Sidewalk stones that were removed by the BBMP and left on a nearby footpath were placed appropriately and excavated mud from nearby was used to fill the crater. The exercise cost nothing but some dedicated time. Chakravarthy has taken the responsibility of ensuring nothing is dumped henceforth. Some policing is required from residents of the area, BM in particular. Usually it is cows, bullocks and the occasional buffalo that come to graze at the lake. For the last few days sheep are being herded into the lake bund. Like dirty flecks of snow the animals scatter all over the sloping grassy side and eat to their heart's content while their keeper lazes on the walk way. Out of concern that the animals should not eat the sprouting leaves of the saplings, I ask the gardener to drive them away but when it comes to the sheep I hesitate. What with bakrid around the corner, it may be the animals' last meal for all I know. My heart goes out to the "bali ka bakra" and I keep quiet. Children's Day was celebrated at South City on Nov 14, 2010. PNLIT set up a stall with a photographic exhibition on the changing face of Puttenahalli Lake and sale of cloth bags. Thanks to everyone who visited the stall. 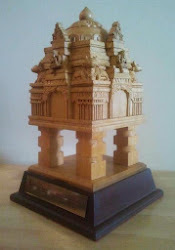 We are very pleased at getting an opportunity to showcase the story of Puttenahalli Lake. Our brightest moment without doubt was this boy, Raveesh, aged about 13 or 14 coming up and saying he'd like to make a donation of Rs. 50. We told him to take a look around and see what is the cause he was donating for. He pored over the posters and photographs, returned to the counter and donated Rs. 150 to the lake fund! We are deeply touched by his gesture. It was as memorable as seeing the once threatened lake filling with water, however slowly, spotting new species of water birds or seeing the saplings grow tall! Once again, thanks to all donors and well wishers. A special thanks to Boutique Fashions Pvt. Ltd., Hulimavu for sponsoring the bags on sale. Mr. Satish (CE BBMP), Mr. Chandrasekhar (EE), contractors and others from the BBMP were at the lake today. Mr. Satish is extremely happy with how the lake is being maintained. The walking track is being repaired by the contractor. Fencing towards the BM arch will be done soon. The fence will be put well inside the premises, and at a lower height, to show that it is not the boundary fence. The boundary fence will be done later. Big catch! Nile Tilapia is an exotic fish. According to recent research in Kenya, it has been found that this fish feeds on mosquito larvae and helps keep down the incidence of malaria. Don't know how it got into the lake! With only one inlet out of the five draining into the lake, the water remained more or less at the same level - low. Despairingly low. We were constantly gazing at the sky like so many Amir Khans. When it did rain, the inflow was barely enough to cover the whole of the lake bed. We fielded questions, criticism and jokes with the wits suggesting that we fill the lake with water from tankers. Since yesterday the level has risen and hopefully silenced everyone. The magic happened thanks to the owner of the coconut grove getting a trench dug across his farm and connecting it to the inlet near the entrance. He may have done it to prevent water logging in his farm but the result? Voila! The inlet near the entrance which had remained obstinately dry all these days turned into a mini waterfall! Today the two security guards at the lake have been given gloves and sacks so that during their rounds, they can also help in clearing up the bags, packets, bottles and other rubbish that are in the plant beds and other areas around the lake. The Puttenahalli lake is ready and waiting for the rains. Hopefully, by the end of the year the level would have risen. Even the little water it has attracts birds. I spotted lapwings, moor hens, snake birds (darters) and of course the pond herons and a few small ones that almost miss the eye. Fellow Trustee Prasanna will be able to identify them. We are writing to let you know about a new development in our neighbourhood, and to seek your support and participation in making this a success. 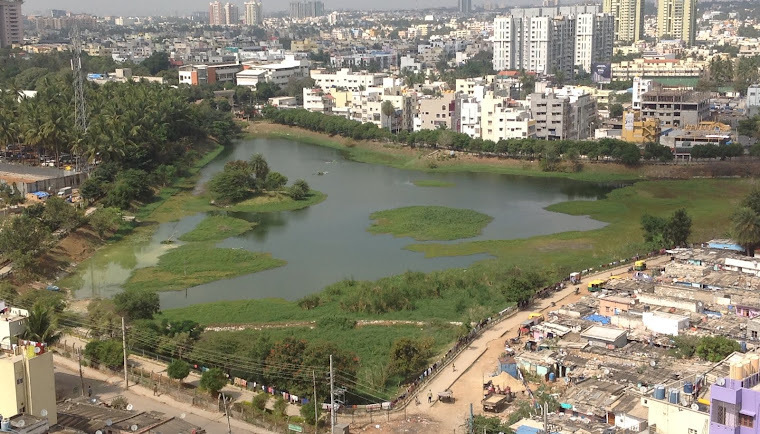 Recently, a few of us from the ‘Save Our Lake’ group of L&T South City and Brigade Millennium formed the Puttenahalli Neighbourhood Lake Improvement Trust (PNLIT), and formally registered it under the Trust Act of the Government of Karnataka - Regn No. BNG(U)-JPN 129/2010-11. Many of you know that we have been working to restore Puttenahalli Lake, and turn it into a place of conservation and recreation amidst our homes. Thanks to the BBMP, allied agencies and individuals, this restoration is now showing visible signs of success. In consultation with the BBMP and experts in the field, we have drawn up a list of flowering and fruiting trees that will attract birds to roost and nest. The PNLIT will procure these saplings from BBMP and private nurseries. Given that PNLIT has been involved in the revival of the Puttenahalli Lake, right from getting it included in BBMP's list of lakes to be restored, we are confident that the management of the area and maintenance of the lake will be entrusted to us. Our initial focus has been the lake and we would like to expand the range of work that we can do together in our neighbourhood. Through PNLIT, we plan to engage in four kinds of work, which we believe will benefit a large number of people in the region around the lake. (a) We will continue our work in environment protection and take up specific initiatives for the conservation of the natural environment in the area. We will do this through specific projects in the natural environment, such as the ongoing lake restoration, where we are looking to 'Create a Habitat for all', ‘Invite the denizens back – the birds, the bees and the rest’, and also through energy and environment projects in the built environment (energy efficient lighting, water conservation, waste management, etc.). (b) We will make specific interventions to boost the economy of the area, and to promote the small businesses that have located here. We will create partnership programs with local businesses that contribute to the overall health of the area, and in turn we will endeavour to deliver economic value to the businesses themselves. We are talking to a few businesses already to see how to tailor this aspect of our work, and we will keep you informed of our progress. (c) PNLIT will also be a strong partner to the charitable efforts of individuals and organisations in the area, supporting non-profit work through grants and other means. This, we believe, will make our neighbourhood a more hospitable place for all people. (d) We will create educational programs that promote social and economic objectives for the neighbourhood, and disseminate this information to the homes and businesses in the area. By pursuing these objectives together, we can build a showcase neighbourhood initiative, and be a trend-setting region of our city. We invite each of you to contribute to PNLIT generously, and make this dream take shape before our eyes. We are happy to report that the initial response to PNLIT and its proposed activities has been very encouraging, and we hope that each of you will take the initiative to add to this momentum. Together we can make Puttenahalli Lake and the region around it a model area.